The goal of the Technology Platform (TP) is to integrate the various PlanetS projects with specific R&D, which will be useful and in some cases even critical for the success of these sub-projects. It offers the possibility to investigate the use of new technology, develop or adapt it for the specific project (see e.g. seed funding and partnership possibilities through our Technology Platform). Finally, it promotes knowledge and technology transfer across research institutes and industrial partners. The main activities of PlanetS’ institutes and projects lie in the domain of astronomy and, more specifically, in that of exoplanets and planetary sciences. Because of the lack of infrastructures, competences and manpower, technological R&D cannot be (solely) conducted by these institutes. On the other hand, most PlanetS projects want to make use of cutting-edge technology to progress in their respective fields. This technology is not available ‘off-the-shelf’ and must be developed in collaboration with industry. The development costs of high-end prototypes cannot be afforded by the industrial Partner alone, and because of the risks inherent to R&D, the commercial benefits cannot be ensured from the beginning. In addition, scientific requirements set by the ‘end user’ have to be converted into technical requirements of a prototype first, and a final product later. This task may be out of reach of both the PlanetS project and the industrial Partner. A third actor, Technical Universities or specialized centers, can help to establish the link between the scientific requirements, on one side, and the industrial product, on the other side. 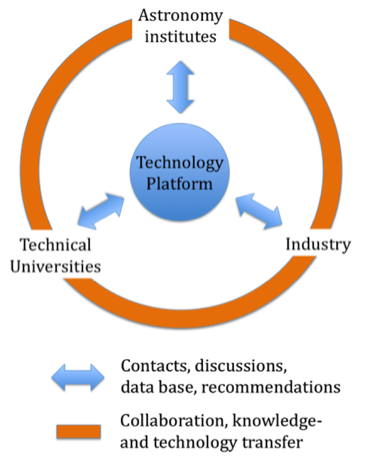 The Technology Platform brings together the three main actors: The scientific community, technical universities and specialized centers, as well as Swiss industry. It promotes exchange of information and knowledge, develop and exploit synergies, and promotes and coordinates R&D activities. Knowledge transfer with a short-term project for a PhD or Postdoc in an industrial environment or research laboratory: financial support up 3 months! Call for ideas: download the proposal submission form for requesting seed funding. On-going and funded projects by the TP. If you worked in PlanetS as member or associate, entitles you to join the our Alumni community. Which are the external sources of funding of your research or start your business? Look at this. List of contact persons and of PlanetS’ technology items. Organigramme and Team of the Technology Platform.